Several layers of paper mache, a coat of silver paint, and tons of small glue-gunned on cardboard tiles (covered with tinfoil) and THE HUMAN DISCO BALL is born (complete with internal wallet and drink holder). 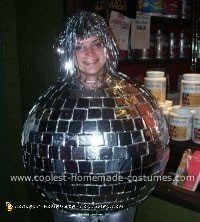 The best part of this homemade disco ball costume is that when I was out clubbing, the ball reflected the lights everywhere, just like the real thing (not to mention that it helps maintain personal dancing space!). What did you mean by an internal wallet and drink holder? Did you keep a bottle of water inside or did you have a spot to keep drinks you bought while out? how did you make the circle shape. Paper Mache (lots of layers) over a yoga ball!